While Minnewaska has its challenges, like no lodge and inconsistent grooming, it’s convenient to the metro NYC area for day trips, with scenery of a unique microclimate and stupendous views. On a clear day, one can see New York City from Castle Point. Hamilton Point trail is NOT included in trail mileage totals. 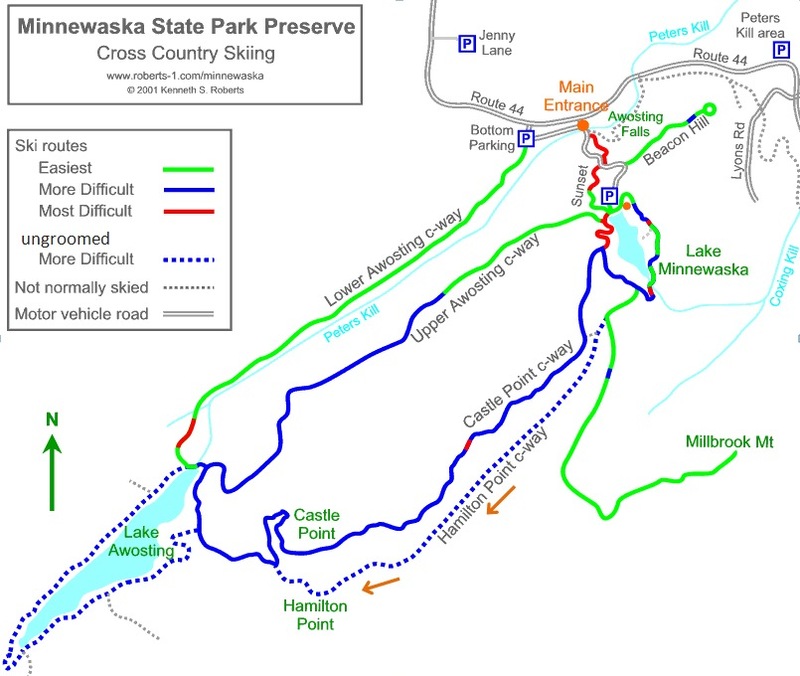 The last few times I’ve been to Minnewaska, this trail has been closed to skiing. Although I’ve seen ski tracks and people poach the trail, there are some very exposed sections there. The trail around Lake Awosting is beautiful, but backcountry skis are recommended as it’s generally not groomed. Lower Awosting Road was closed in the aftermath of Hurricane Irene when I ran there in Dec 2011. Upper Awosting trail is closed at Awosting Falls. They don’t report ski conditions online.